MUNICH — Bavaria’s Culture Ministry, responsible for Bayerische Staatsoper and Staatstheater am Gärtnerplatz, among many other entities, underwent a sudden double shake-up this morning with the firing of its cheerful chief, Ludwig Spaenle, and an organizational severing into two parts. Bernd Sibler, 47, is the new Kultusminister. The former Bayerisches Staatsministerium für Bildung und Kultus, Wissenschaft und Kunst (Bavarian State Ministry of Education and Culture, Science and Art) is now two ministries, divided at that comma for the third time in its history. In a more subtle change, the word Bildung (learning) has been replaced with the sterner term Unterricht (instruction). The shake-up came at the behest of Bavaria’s forceful new Minister-Präsident, Markus Söder, 51, who replaced Horst Seehofer when the latter joined Angela Merkel’s cabinet in Berlin last week as Federal Minister of the Interior. (The two are pictured.) Merkel and Seehofer, who differ on the sore topic of immigration, belong to the CDU party and its Bavarian ally, the CSU, respectively. 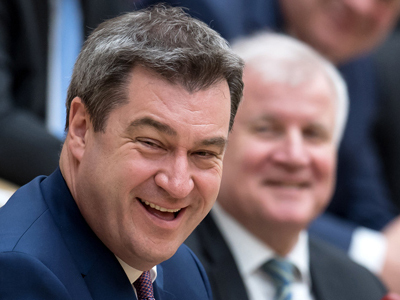 Söder and Sibler are CSU members. It is unclear what moves Söder, through Sibler, will make on Bavaria’s lavish arts budgets. He has been Seehofer’s Finanzminister these last seven years, and known as a fiscal hawk not much connected to the classical music scene. Bavarian King Ludwig I established the Culture Ministry in 1847, soon broadening it to embrace “all aspects of upbringing, instruction, morals, spiritual and artistic learning, and the institutions for them.” It became a state body in 1918, when the monarchy fell; a purveyor of Nazi ideology in schools and universities, art and culture, in 1933; and a champion of freedom, rule of law, and democracy after the Second World War. Minister-Präsident Franz Josef Strauß in 1986 was the first to divide the ministry, on the pattern now mimicked by Söder. It was reunited in 1990, divided again eight years later, and reunited in 2013. Its spiritual mandate never disappeared: Kultus means worship, or adoration, as well as culture. This entry was posted on Wednesday, March 21st, 2018 at 4:48 pm	and is filed under Munich Times. You can follow any responses to this entry through the RSS 2.0 feed. Both comments and pings are currently closed.